REVIEW – I am definitely a firm advocate for the use of screen protectors, going back to the cr@ppy thin plastic films I applied on my Palm Vx. I even pressure many friends and family members to use them. I even go so far as to supply and apply them…obsessive, compulsive I know. 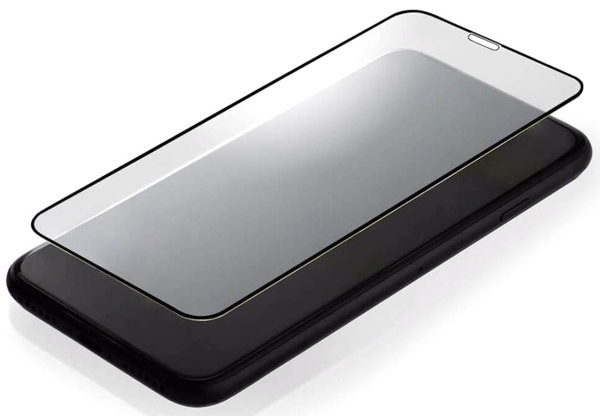 Today’s multilayer, precision-crafted tempered glass screen protectors do an incredible job protecting your smartphones and have become impressively inexpensive/cost-effective to use. For this review, totallee has sent me their new edge-to-edge screen protector for the iPhone Xs Max to see how it compares to an insanely crowded field of competition. BACKSTORY – I’ve reviewed and used all types of tempered glass screen protectors over the years, ranging in price from $2 all the way up to an eye popping $50+. The one you see in this picture is a generic one I purchased from Amazon.com for all of 3 for $10. I’ve had it on my iPhone Xs Max since day one and it has done a fine enough job…though thankfully never truly tested. But as you can see, it doesn’t cover the entire screen, sitting several millimeters off all four of the edges. I actually felt bad taking it off, more or less destroying it in the process, to do this review…hopefully this totallee edge to edge screen protector makes it worth the effort/carnage 😉 . This totallee screen protector is an edge to edge piece of tempered glass, engineered specifically for the iPhone Xs Max. As I mentioned, this screen protector is made from a very thin (0.33mm) sheet of glass that has been precisely cut to fit over the entirety of the iPhone’s OLED screen. Other than its edge-to-edge fit, the only two design features of note are the speaker cutout at the top and 2(ish) millimeter black band encircling protector’s edge. Installing the totallee screen protector was easy enough. You more or less lineup the speaker cutout and sides correctly and then let go (see video here). Though like any glass screen protector, you have to be careful to not have or let any bits of dust sneak between the two pieces of glass during installation. I did have to use scotch tape to remove a few myself and the screen protector withstood the force of me lifting an edge or two several times to get it perfect. The only thing I might suggest is that totallee include an installation tray which would help place the screen protector more precisely since it is so exactly fitted. If you’re off just a fraction of a millimeter, you may need to reseat the thin sheet of glass which could break or get dust under it. The totallee screen protector fits the iPhone Max perfectly. The black bezel makes the screen protector almost disappear (much more so than the previous one I had on my smartphone). The totallee is relatively thin, thinner than some other tempered glass screen protectors I have used in the past. There has been no impact to screen sensitivity or FaceID accuracy. While I haven’t tested its strength, hardness, or protection factor, the totallee screen protector is doing a perfectly fine job protecting my screen. 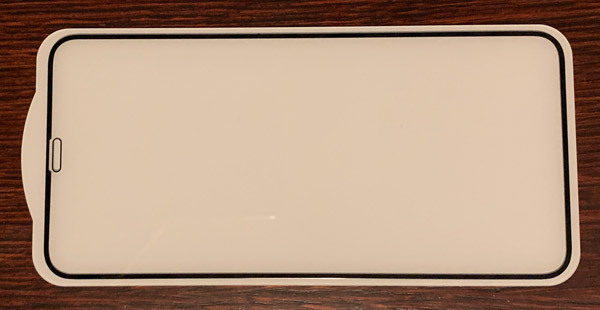 It marks off all the typical boxes for a tempered glass screen protector these days: completely clear, extremely thin, 9H hardness rating, and oleophobic coating. Add in the fact it covers the entire screen, the totallee screen protector does not disappoint. totallee makes tempered glass screen protectors for a multitude of smartphones, ranging from the Pixel 2 to the latest and greatest iPhone Xs Max. They offer a 30-day money back guarantee and 2 year warranty on all their gear. With countless screen protectors under $10 on Amazon, justifying a $25 screen protector is pretty tough these days. That said, the totallee tempered glass screen protector certainly isn’t the most expensive one on the market either. 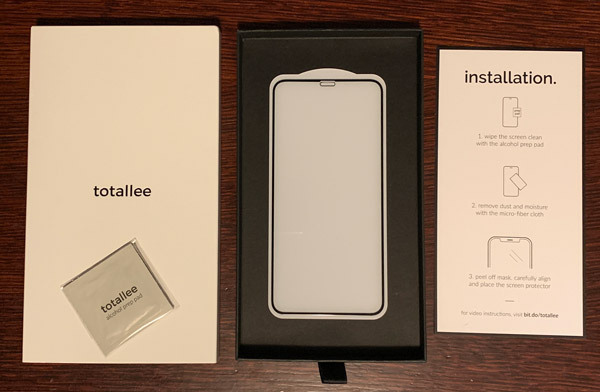 totallee has created a very well done, nicely thought out iPhone Xs Max accessory that does an excellent job protecting your $1000+ smartphone. With its edge-to-edge design and oleophobic coating, you hardly know it’s there while providing solid protection. Source: The sample of this product was provided by totallee. Good review thanks for sharing it.